BattleCON: Unleashed – The Ultimate BattleCON edition has less than two weeks to go. 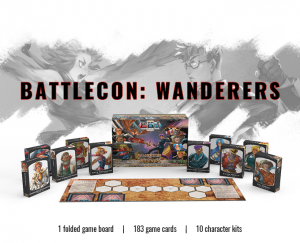 Just a quick recap, BattleCON is a head to head card game for two players, based loosely around the mechanics and tactics present in 2D fighting games. In BattleCON, players choose characters with unique abilities and powers to test against one another in a battle of tactics, strategy, and intuition. When I think about Kickstarter Level 99 Games is one of the first companies to come to mind. Since 2011 BattleCON and all subsequent expansions (and other L99 games) have been successfully funded, and now comes the big kahuna. Maybe you want to see what all the hype is about and want to start with a couple of characters in the online game? Or you want to grab the newest physical version wanderers? Or perhaps your an experienced BattleCON player looking to obtain some promos and the enormous storage box. This campaign has a little something for everyone. And now let’s switch gears, from a KS veteran to a newcomer. Wardens is a 1 to 4 player, post-apocalyptic adventure set in a Lovecraftian steampunk universe. Play as Cthulhu and his legion of Starspawn and spread madness over what is left of humanity, or play as the Wardens team as they face an epic, final journey across a ravished world. Wardens can be played 1 VS all, Solo and Co-Op. A bunch of games let you summon Cthulhu, but this game enables you to be Cthulhu (An 81mm Cthulhu no less). 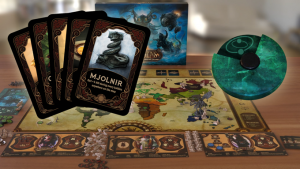 Minis and, Metal coins, awesome art (including a creepy looking Mjolnir card). This, not just another churned out Lovecraft game, playtested at length for your madness… err pleasure, you can find the campaign here.